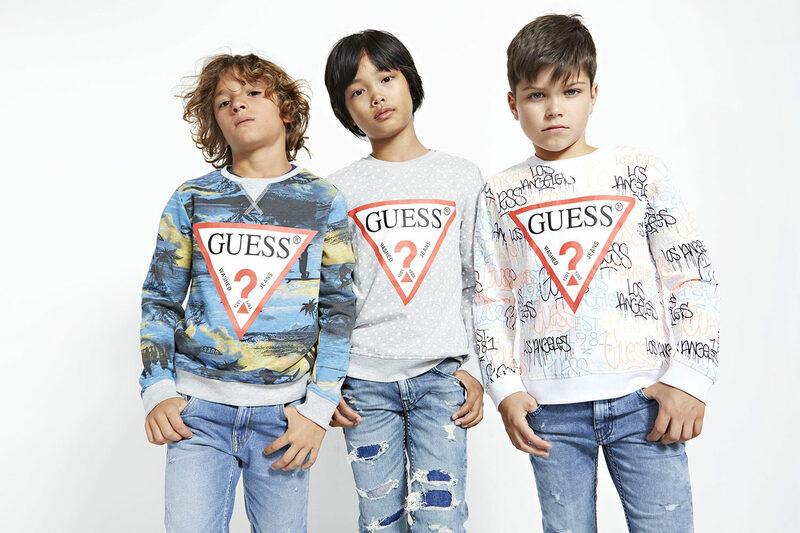 GUESS Kids, the children’s line extension from global lifestyle brand, GUESS? Inc., is a fashion-forward collection of clothing geared towards the trendsetting boy and girl. Initially established as Baby GUESS in 1984 featuring a line of baby’s clothes, the label later changed its name when the brand began introducing a wide-range of clothing for toddlers and kids. Charming the world with its playful, yet creative apparel worldwide, customers have full access to the trend-savvy styles on the GUESS Kids e-commerce site at the click of a button. The GUESS Kids collection features a variety of silhouettes across sizes 2-16 in girls and 2-20 in boys. For newborn girls, designs range from one-piece body suits, two-piece top and bottom sets as well as a selection of ruffled babydoll dresses with built-in bloomers. An assortment of tee and pants sets, coveralls and playsuits can be spotted season after season for newborn boys. Girls sizes 2-16 are offered a variety of trend-driven garments including dresses, tops, outfit sets, bottoms, denim as well as an array of jackets and sweaters to satisfy any mini-fashionista’s wardrobe. For boys sizes 2-20, a mixture of graphic tees, button-down shirts, bottoms, denim, jackets and sweaters dominate each delivery’s new arrivals.